My friends at Sydney homewares and textile designers Dandi put together a gorgeous baby shower for team member Leezar recently. 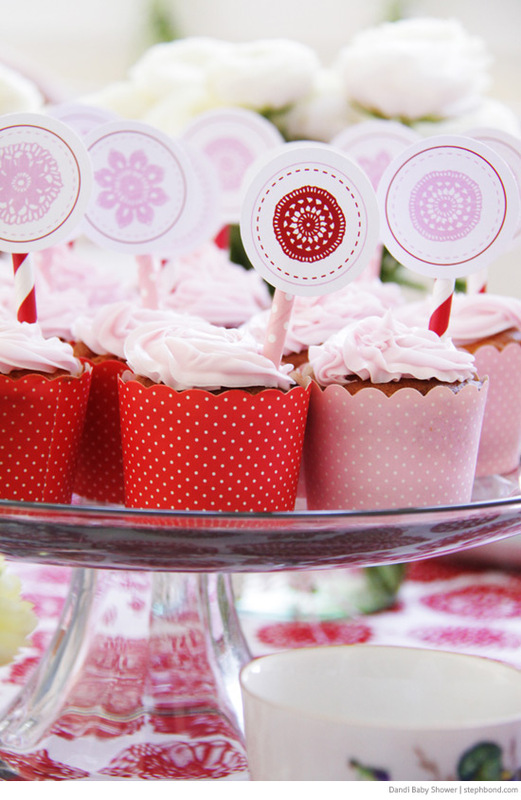 I love the red and white theme with a vintage touch for a baby shower, especially if you don't know if a little boy or girl is on its way. I think this theme would also be gorgeous for a girl's birthday party, and stunning for Christmas too! 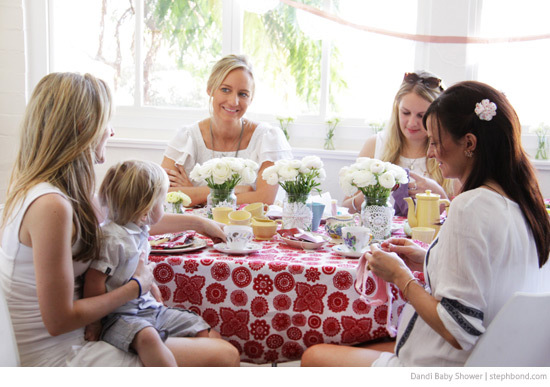 Caroline and Mindi from Dandi share their tips and tricks for styling this gorgeous baby shower below. AND there's a super-easy tutorial to make the gorgeous doilie bunting garland. Enjoy! Cake: Mindi made her signature Oreo cupcakes. Topped with pretty pink icing and Dandi printable cupcake toppers. Using cardboard cupcake cases makes all the difference, they hold their shape and look extra special. Food: It was a brunch, we had a delicious mini quiches, smoked salmon and corn fritters with horseradish cream, tomato and ricotta tart. 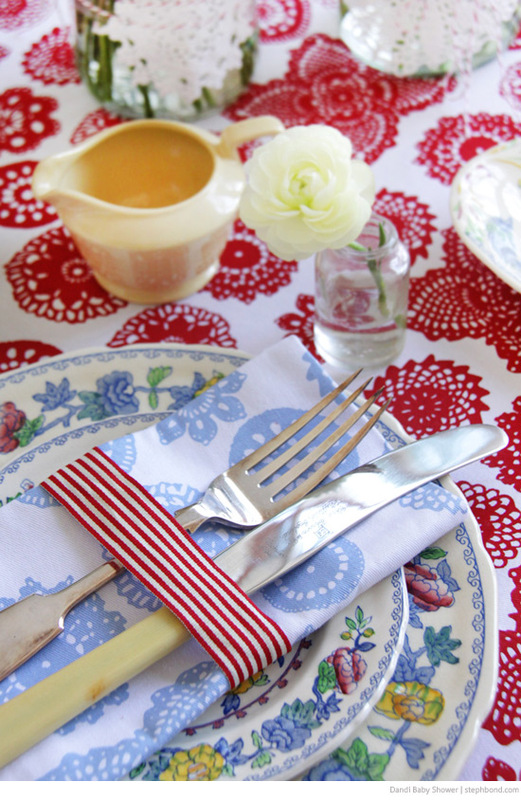 Decor: Dandi Doilie Berry tablecloth with all our vintage treasures to adorn the table. 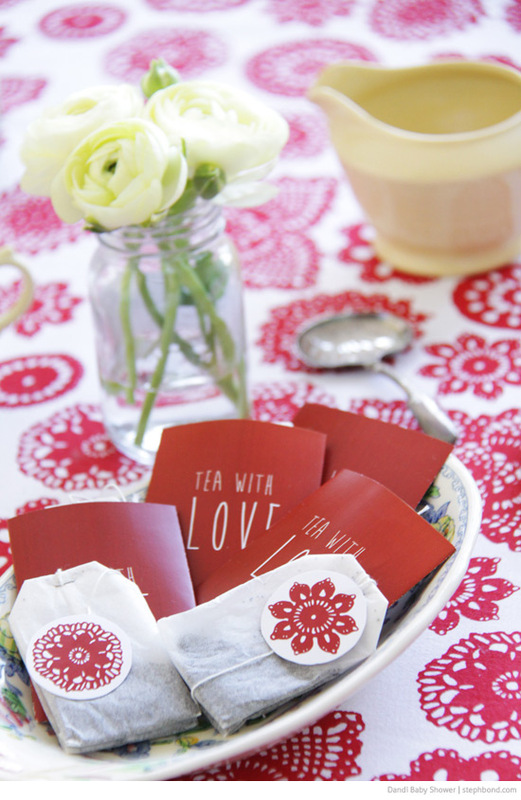 We used really colourful decorative plates - the red picked up the doilie tablecloth and the yellow in the pattern matched our old tea set beautifully.We created paper tea bag pouches from Dandi Free Printables and placed these on the table. We played on the vintage doilie theme and created a garland from paper doilies (tutorial below) and strung it up along the window. 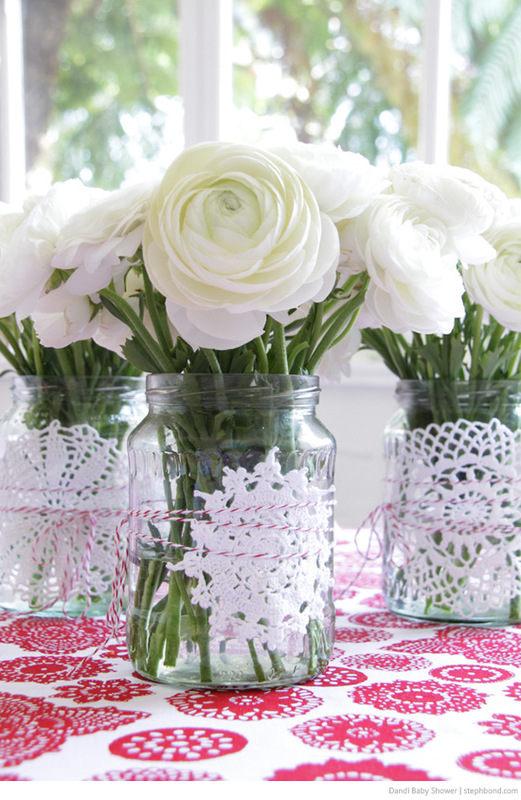 We also used doilies to wrap around the old pickle jars for the flowers. A row of vintage bottles were placed on the window ledge with white flowers. A bit of repetition goes a long way in decorating. We tried to keep our styling details (ribbons, paper doilies, string and paper crafts) to a red and white to match the tablecloth. 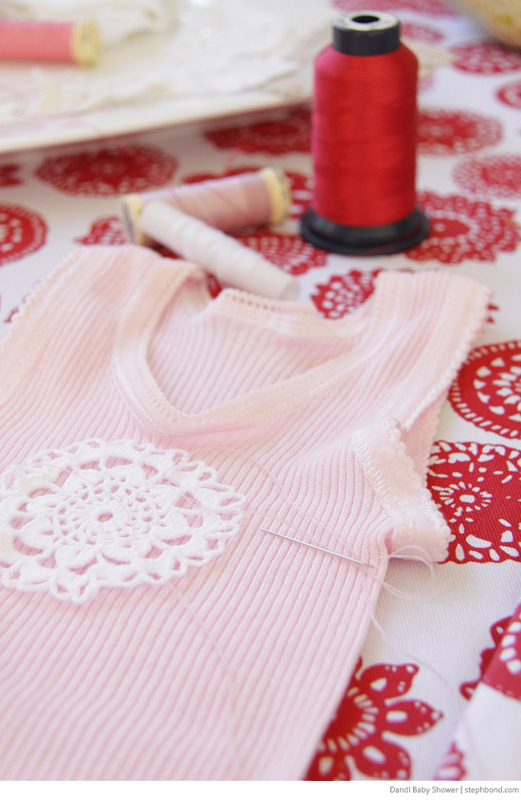 Activities: We were each given a baby singlet to decorate using a choice of coloured threads and delicate vintage doilies. We each created something special for Leezar’s little baby girl. A circle of great friends, all chatting, and sewing our hearts out for the little baby bump. Iron the tablecloth and set the table the day before, only leave the cooking until the day of the event. This ensures you get to not only host the event but enjoy it too. Keep it intimate - a small group means you get to have lots of quality time with your VIP guest and lots of tummy rubs. Something special: All the tiny singlets were bundled up and taken home by our beautiful mum to be. The tea pouches were also lovely ‘take homes’ each guest loved their little ‘Tea with Love’ keepsakes. 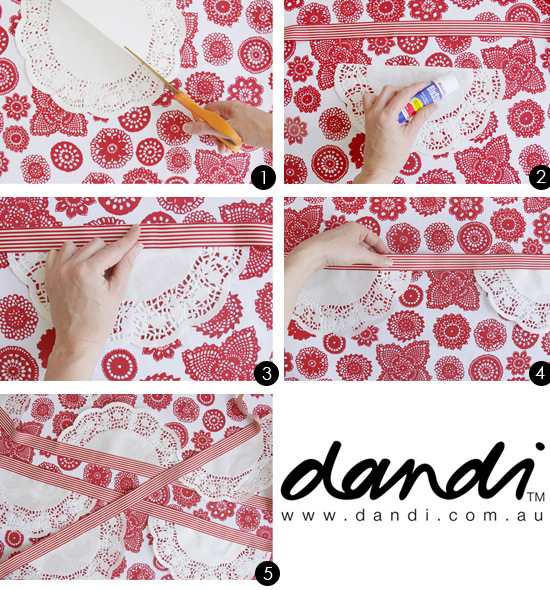 Here's a fun and easy tutorial from Caroline and Mindi at Dandi to make a sweet doilie garland for any occasion. 1. Fold the doilies in half, and cut along the centre crease. 4. Repeat with the remaining doilies leaving 5 to 10cm centimetres between each one. 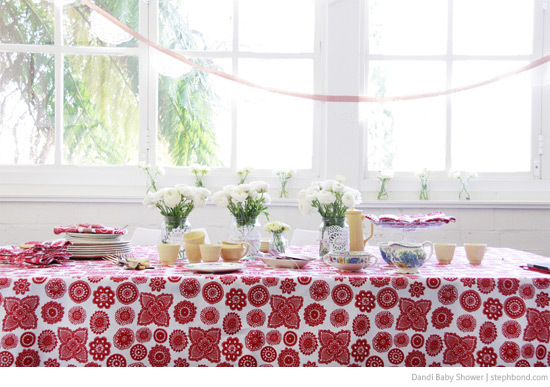 Thank you Dandi for sharing this gorgeous baby shower and bunting tutorial! How gorgeous for a child's room too.